This is the second in a series of posts about the Maths Day I did in my daughter’s Year 7 classroom. Last time, I talked about the awesomeness of the day as a whole. For the next few posts, I’ll talk about the actual activities we did. After the general intro into me and what I do, we launched straight into Quarter the Cross. This is one of my favourite problems ever, and you can read all about my love affair with it here. As I said there, it has so many opportunities for mathematical thinking and creativity. Yet the big question on the lips of several educators on Twitter is “How do I implement it in a classroom.” Well, here’s how I did it. I told the students they could use whatever method they liked of quartering the cross, including drawing lines with rulers or cutting them out. The important thing was that they could explain how they knew it was a quarter. I said I would be looking for some people to share their solutions with the whole class. We gave everyone a sheet with five of the puzzles on it in white, telling them they could always get more or draw their own. Then I gave them 10 minutes to play with it on their own, after which we’d stop to talk about it as a class. While they worked on it, we circulated and talked to the students about what they were doing. Even though we said they had to do it on their own, we didn’t tell them off for discussing with people around them quietly. I was not disappointed. Almost everyone had one or both of these. I asked a couple of students with these solutions if they’d be ok with sharing theirs with the class. I also looked out for several other interesting solutions that I thought would inspire other students or have something cool to talk about, asking some more students if I could call on them too. Then we stopped the class and had a whole-class discussion. Now we called a whole-class discussion, I called upon the students I had picked to share their solutions and explain how they knew they had a quarter. They showed their solutions on the document camera (the teacher Anne called it a “hovercam” which was a new word for me) so that everyone could see it on the screen. The first solution was the house-shaped one I showed earlier. The first student explained how there were four squares and one left over, so they took one square and a quarter of the middle one. I asked for a show of hands to see how many people had this solution (pretty much everyone). 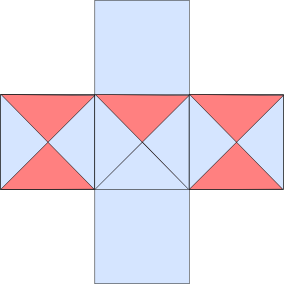 Another student had done this one, but literally cut the cross into quarters, and I asked him to show how the four identical pieces fit together to make the whole cross. The second solution was the L-shaped one I showed earlier. Again I had two students show their solutions: one student had drawn it on paper, and another student had actually cut it out and folded it twice. I said how much I loved that there were multiple explanations, and this set the tone for what followed. Now I called upon the other students I had picked out. They brought their solution out and showed it on the camera, and explained how it worked. Several times I asked other students if they had an alternative explanation of why it really was a quarter. One student explained how you could show his was the same as the first one by literally cutting a bit off his and fitting it back together again. 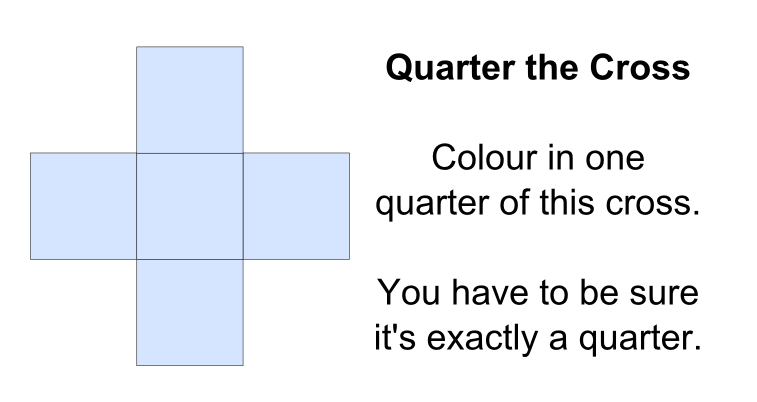 I was proud of my daughter Kaylee for being brave to show her solution, where she had divided all the squares into 16ths and coloured a random four of each of them. After I had exhausted the people that I had pre-selected, I called on anyone else to share one if they wanted. I don’t really know how long this middle part went on, but after everyone had shared what they wanted to, I asked them to see if they could make some more solutions, based on the inspiration they had seen in the other students’ solutions. I asked them if they could make it look surprising or so it didn’t feel like a quarter. It’s a testament to how engaging this activity was that several of them had actually already started making more solutions while they were listening! This time we encouraged them to talk to each other, and talk to each other they did. Many students went up to one of the presenters and asked them again how they did what they did so they could try it themselves. Some students wondered about doing thirds, and I had a most productive discussion with them about how to divide a square into thirds. 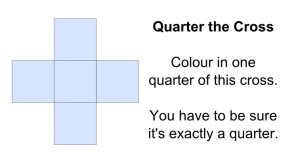 One student realised that to make one whole square you could have any two pieces as long as they fit together to make a full square. 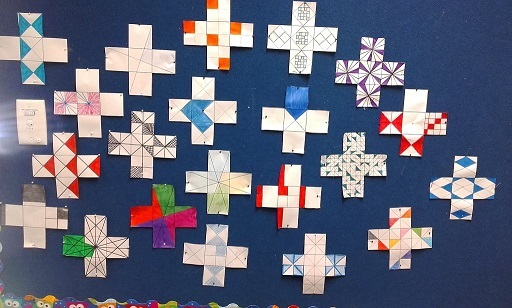 One decided to divide the cross into any old pieces and then divide each of those into quarters. In short, it was really quite a fabulous time of maths and creativity. I am really proud of how this went. In many ways it was the perfect way to start. The problem is straightforward enough to get into quickly, and had that wonderful opportunity to allow students success in presenting their explanations. Plus it produces something pretty to go on the wall: as we all know, leaving artifacts behind is an important part of learning! If I were to do it again, I would make sure my handouts had squares a whole number of centimetres wide. Then they would have been able to more easily divide the edge into fractions of their choosing, plus reinforce some other skills too. 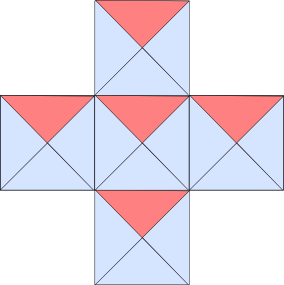 On that note, here is the small version with five crosses, and here is the big version with one cross, both with a whole number of centimetres for the squares’ sides. Also, if I had more time, and an inclination to do so, I would probably get students to start representing some of what they see with equations involving fractions. Things like 5/4 = 5*1/4 and 5/4 = 1/2 + 3/4. In the end, though, I was so happy with what we achieved on the day. When we got home that night, my daughter Kaylee kept working on the Quarter the Cross, investigating many different ideas she never got to during the day. My younger daughter Charlotte wanted to join in too, and we made several solutions together which were built from cutting the cross in half and half again, then cutting the solutions we had up and arranging them differently. (Charlotte did a big one too, which Anne graciously put up with the others on her class pinboard.) I don’t know what happened in other households, but in mine there were several hours of mathematical play that this inspired outside of class. Of course, causing hours of mathematical play is my usual experience with Quarter the Cross 😉 . This entry was posted in Being a good teacher, How people learn (or don't) and tagged Maths Day. Bookmark the permalink. The activity uncovered misconceptions about fractions and raised the question about when it is important to be accurate, and when near enough is good enough. So glad they are still talking about it. It makes me happy that it has fueled so much interest, and so much learning in the longer term.